My husband and I have had plenty of practice moving! We have been married 14 years and in that time we have moved 9 different times. This includes 6 different cities and 4 moves across the state border. 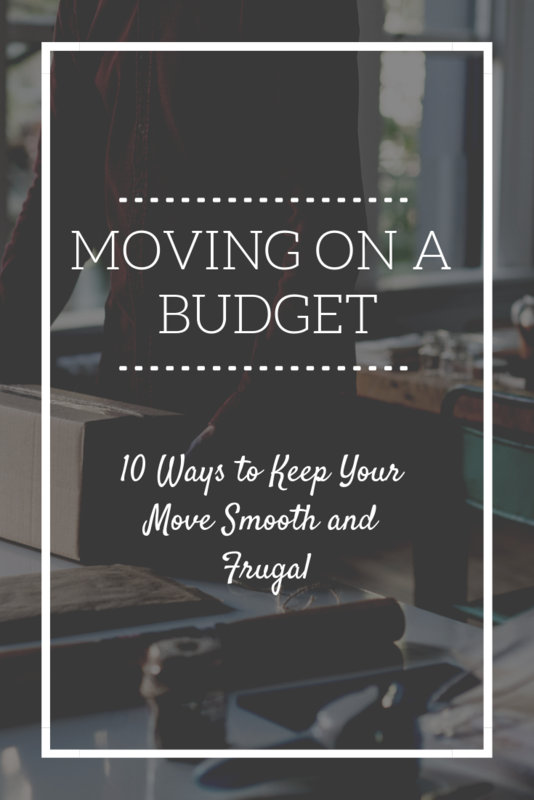 We have made PLENTY of mistakes along the way, and over time have learned the best ways to keep the move simple and most importantly, FRUGAL. I wanted to share a few of the tips and tricks we have learned a long the way to help you on your upcoming moves. The moment you know you will be moving, make a plan. Set a budget of how much money you will be able to spend on this move. Once the budget is made, stick to it. Whatever number you decided on, find a way to make it work. It might not be easy, it probably WON’T be easy, but you need to do what you can to stay in budget. After you have your moving budget, you will want to set up a sinking fund. This sinking fund will help you slowly save up cash, so that when the time comes you will be prepared financially for the move. If you know of the move months in advance this should give you plenty of time to contribute to your sinking fund. If the move is quicker and you will only have a few weeks still make your sinking fund and try to save as much as you can each day. You want this sinking fund to be able to cover the cost of your move. If going the DIY route for moving isn’t the best option and you will need to hire a moving company. Always shop around before hiring anyone. Get quotes from a variety of moving companies and check referrals to find the best company for you. Consider doing half of the work yourself and hiring the moving company for the other half. Don’t be afraid to barter a little and ask them to beat competitors prices or give you a discount. The worse thing they could say is no. From the very first minute you find out you’re moving be on the lookout for boxes. If you know where to look they can be very easy to find. Ask all of your friends and family to start giving you all of their amazon boxes or any other box they might get in the mail. Be on the look out for boxes at the grocery store. You can usually find a cart or two full of empty boxes from employees stocking shelves. Most stores are more than happy to let you take boxes. We found the BEST boxes at Lowes. Some employees will happily give you large boxes, but others weren’t so sure…..so maybe ask a few different people! Pack your fragile items with a few of your soft household supplies. This will save you from needing to buy packing paper. I will usually wrap my dishes with my dishcloths and pack some of my fragile decor with my towels. There are so many options, get creative, you could use sheets, clothes, blankets, etc. With moving comes cancelling/setting up utilities. Before setting up internet, cable, phone, or dish be sure to shop around. Many of these companies will give a good discount to new customers. This could also be a great time to change habits and ditch the cable all together. Moving is STRESSFUL, expensive and hard! Give yourself grace and try to be flexible with all of the ups and downs that will come your way. Remember that the hard moments will be temporary, and one of the only ways to get through it is just to grin and bear it. Be true to yourself and your budget, but also be willing to go with the flow once the time comes.